With only his thin bare arm to shield him, the young soldier bravely charges forward into a storm of bullets, canister, grapeshot and shell. Though his arm is raised in a protective gesture, the soldier's thoughts are not of safety. Nor does he consider that death rushes toward him with each oncoming missile. With bayonet fixed on his trusted rifle, his only conscious objective is to gain the Union lines and there give his all in defense of his beloved Southland. Accounts of Civil War infantry charges frequently refer to the natural humareaction of shielding one's face, an instinctive reflex that reveals the frailty of even the hardened veteran. Under fire that can shatter and twist massive artillery pieces, the gesture is pathetic in its futility. Yet it points up the heroic and powerful in human nature that moves us forward against all odds in pursuit of our ideals. In his fine book Pickett's Charge, George R. Stewart wrote: Much of human nature, good and bad, displays itself on a battlefield. In a sense, even, the charge may stand for all of human life. Some time in the years, if not daily, must not each of us hear the command to rise and go forward, ...cross the field, and go up against the guns? The rifle is a .54 calibre Harper's Ferry Model 1841 "Mississippi." Its new allegiance is shown by the added sabre bayonet manufactured by Confederate Boyle, Gamble and MacFee of Richmond, VA. The bayonet is affixed by a bayonet adapter patented and produced by the same company. The cap pouch, cartridge box and wood drum canteen are also Confederate made. The soldier wears a Richmond Depot, Type III, grey kersey wool shell jacket of mid-to late-war issue and captured Federal trousers with an oval general service CS belt plate. The ragged, shell-torn bedroll tied over his shoulder holds all his worldly belongings. The shattered wheel is the remains of a departed Federal field piece, while the canteen and .58 caliber Model 1855 rifle-musket (Springfield) are the "remains" of a hastily departed Yankee. 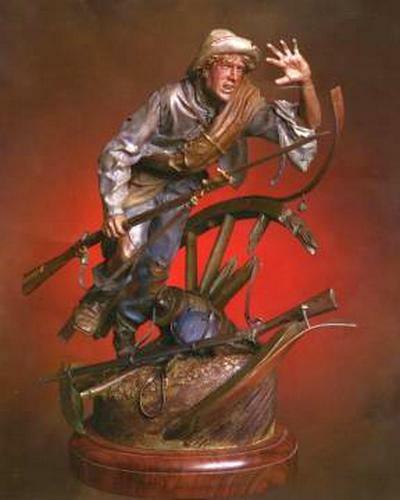 PERSONAL NOTE: Charlie, the model for this sculpture, is a cousin of Layne, a young man who was like a brother to me and modeled for several of my works, including "Carried to Safety." As noted in the write-up for that sculpture Layne was killed in an automobile accident--the victim of a drunken driver--the very night that piece was finished. Charlie, attempting to rescue a cat stranded on a utility pole, took 7200 volts of electricity through his body. He survived but was not expected to walk again. However, just as his father had done twenty years earlier when told he would never walk again after an accident that crushed his back, Charlie, against all odds, proved the doctors wrong. Through months of pain and perseverance, and sustained in his battle by a loving family and his faith, Charlie rebuilt his shattered body. And though he was barely strong enough to hold the pose, I knew Charlie would best portray the Truth behind "Through Shot and Shell"--that inner courage and perseverance, though clothed in frail human form, will sustain us through the "shot and shell" of adversity and carry us to victory.